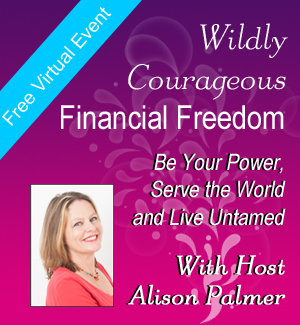 Wildly Courageous Financial Freedom Global Summit! The greatest joy in what I do is to share time, caring, knowledge and my Golden Purpose to help others grow as leaders, design their path to financial freedom and greatness in themselves–and their BUSINESS–and therefore make a bigger difference in their communities and the world. As a guest on the global tele-summit, Wildly Courageous Financial Freedom, I was interviewed by the host, Alison Palmer. Alison is an English woman, living in France, who has a a huge mission, a huge heart and a huge gift of wisdom and passion for helping others achieve what they most want AND deserve. Here’s what Alison said about her interview with me: “I feel so calm! My incredible guest today, Lynnea Hagen, shares her visionary process for clarifying your real purpose here on Earth. I know you dream of making a meaningful impact through your business and creating the income to live the life you know you’re here to live. Lynnea can help you…She’s going to walk us through some very simple steps and give us beautiful images to hold that speak of a profound truth that will make you feel so grounded in such a deep way. You’ll feel as if you touched base with your inner core in a way that you have forgotten for a long time. Alison is a wonderful interviewer, who really listens and feels deeply into what people need and what message needs to be brought to the world. I feel it’s one of the best interviews I have ever done, and give it to you as a gift of love and abundance. Listen to Lynnea’s inspiring, energizing and very practical interview for this global summit. « Boost Sales by Using Love and Time to “Educate the Old About the New”	» What “Trademark” Are You Leaving With Others?